The article framed this skill as being able to ask succinct, open-ended questions to each of a startup’s stakeholders, such as potential users, mentors and partners. Students in the lab can completely attest to this. When my team worked on NewsLing — a translation product for local TV broadcasts — last summer, this skill was invaluable. If we had asked poor questions, we might not have reached the final product that we did. Our initial prototype was just text, and if we had just asked for feedback on that product, we probably wouldn’t have learned that our users actually wanted a real-time, audiovisual application. Students in the J-school quickly learn that fact errors are deadly. One inaccuracy, even a misspelled name, is an automatic 50-point grade deduction. So you could say that our staff is quite experienced in making sure that all of our research is based in fact. When someone starts a sentence with “I think,” our executive director immediately instructs the team to find a definitive answer. Sure, sometimes this leads to major obstacles when a team discovers that they are working on a false assumption, but false assumptions often cause ventures to fail. When a story doesn’t go as expected, journalists know to cut their losses or pivot — this holds true for product ideas too. The original article reminded me of one of the biggest takeaways staffers learn at Reese News Lab — teams need diversity of thought and skill. When a professor from the UNC business school visited the lab, he was thoroughly impressed by our commitment to building and testing prototypes with potential users. He remarked that business school students often get too entrenched in the numbers and forget to test an actual product. Then again, journalists and spreadsheets aren’t always the best of friends, but that’s why we build teams. Lincoln Pennington is a sophomore in the journalism school at UNC Chapel Hill with a second major in political science. He works as a staffer for reesenews.org and tweets from @Lincoln_Ross. He is a politics junkie interested in the future of the media and hopes to work in D.C. upon graduation in 2016. Reese News Lab is an experimental news and research project based at the School of Journalism and Mass Communication at the University of North Carolina at Chapel Hill. 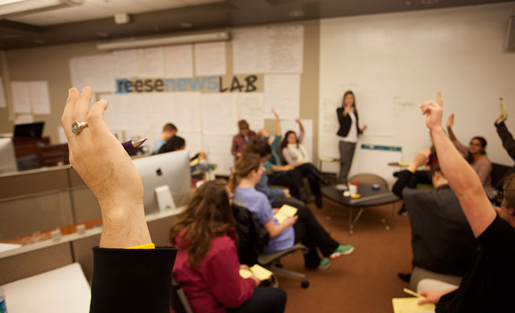 The lab was established in 2010 with a gift from the estate of journalism school alum Reese Felts. We develop and test new ideas for the media industry. Undergraduate and graduate students learn about the state of the news industry, pitch product ideas, conduct user testing and develop prototypes. The staff of undergraduate and graduate students are required to document their work throughout their projects, compiling their research, results and recommendations on the viability of their product ideas.